Does minimizing interest-rate risk in your bond portfolio have to mean lower yields? Floating-rate loans are different from other bonds. Floating-rate loans are known by many names, including bank loans, senior loans and leveraged loans. These loans are typically extended to companies with higher levels of debt relative to their cash flows and because of this, they carry greater credit risk than investment-grade bonds. But unlike traditional bonds, floating-rate loans don’t make a fixed interest payment, or coupon, each period. Instead, their coupons reset every 30, 60 or 90 days, floating up or down with the changes in prevailing interest rates. This floating feature makes loan prices less sensitive to shifts in interest rates. Floating-rate loans are an exception to the rule. Rising interest rates are a challenge for fixed-income investors, because it generally means falling bond prices. A common tactic is to invest in bonds with shorter time horizons to make a fixed-income portfolio less sensitive to interest rate changes. But in most cases, a shorter duration also results in a lower yield and less income. Floating-rate loans are an exception to this rule. Regularly resetting coupons give floating-rate loans an extremely short duration — generally no longer than the time between reset dates. And despite the short duration of floating-rate loans, their yields tend to be relatively high, commensurate with their credit risk. Floating-rate loans are unique in this combination of characteristics. 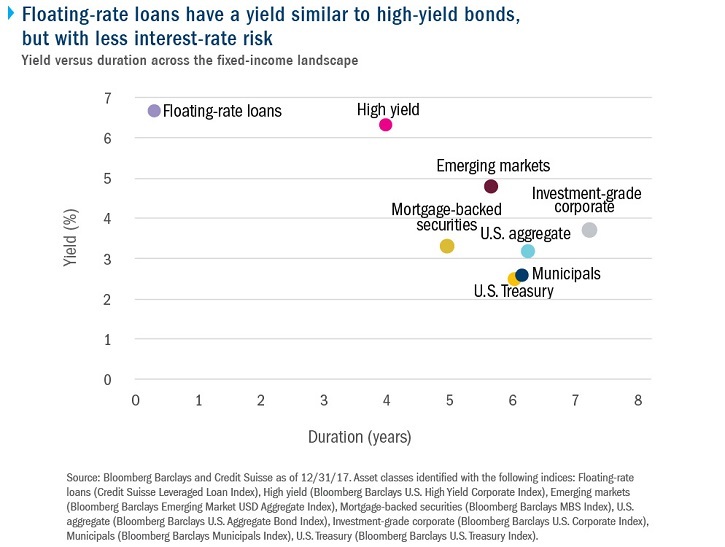 On the chart below, one dot stands out from the rest: Floating-rate loans have a yield similar to high-yield bonds, but with less sensitivity to interest rate changes. As fixed-income investors try to navigate the new interest rate regime, it can be increasingly challenging to generate reliable income. Generally, reducing interest rate risk in a bond portfolio means investors have to accept lower yields. 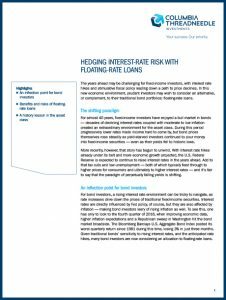 But floating-rate loans are an exception, offering low interest rate risk along with higher yields. The Bloomberg Barclays Emerging Market USD Aggregate Index is an unmanaged index that tracks total returns for external-currency-denominated debt instruments of the emerging markets. The Bloomberg Barclays Municipal Index is an unmanaged index considered representative of the tax-exempt bond market. The Bloomberg Barclays U.S. Aggregate Bond Index is a market-value-weighted index that tracks the daily price, coupon, pay-downs and total return performance of fixed-rate, publicly placed, dollar-denominated and non-convertible investment-grade debt issues with at least $250 million par amount outstanding and with at least one year to final maturity. The Bloomberg Barclays U.S. Corporate Index measures the investment-grade, fixed-rate, taxable, corporate bond market. The Bloomberg Barclays U.S. High Yield Corporate Index is a market-value-weighted index which covers the U.S. non-investment-grade fixed-rate debt market. The Bloomberg Barclays U.S. Mortgage-Backed Securities Index measures the performance of investment-grade, fixed-rate, mortgage-backed pass-through securities. The Bloomberg Barclays U.S. Treasury Index includes public obligations of the U.S. Treasury. The Credit Suisse Leveraged Loan Index tracks the investable market of the U.S.-dollar-denominated leveraged loan market. It consists of issues rated “5B” or lower, meaning that the highest rated issues included in this index are Moody’s/S&P ratings of Baa1/BB+ or a1/BBB+. All loans are funded term loans with a tenor of at least one year and are made by issuers domiciled in developed countries. Indices shown are unmanaged and do not reflect the impact of fees. It is not possible to invest directly in an index.